Google Reader is officially stopped recently so we have to go for alternative readers to read our favorite stories on the web. Fortunately the other readers provide the support for import your Google Reader data to build your favorite list of sites and starred items. Google only allows downloading your data until July 15, so you have to export your data from Google Takeout. After the exporting your data, you can import the all old items into your alternative feed readers like Feedly, Digg Reader and more. Digg Reader is developed by Digg social news site and it is becoming one of the popular readers now. 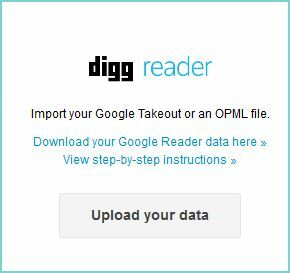 Here are the steps to import your Google Reader feeds into Digg Reader. 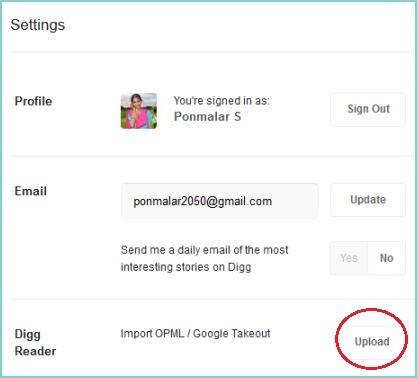 How to Upload Google Reader Data to Digg Reader? 2. Sign in to your Digg Reader Account. If you do not have one, you can simply create through your Facebook, Twitter or Google accounts. 3. Click on the top right icon to view the settings. In the Digg Reader section, click the “Upload” button. 4. Click on “Upload your data” button and then select your downloaded zip archive file of Google Reader data. Digg Reader also supports importing OPML XML files, which most readers services will export. After the import process completes, you will see and access all of your old Google Reader subscriptions including your starred items from the saved section.